This one is for PawPaw... take a knee. It's an old saying that Chris' dad used to tell Kellie when she was playing softball. I have been trying for a few weeks to catch Taylor doing this and finally did. Thanks for the inspiration Kel! And I have to do some work this afternoon, but will finally post pictures from my Stampin' Up workshop Saturday. I haven't forgotten Mel! 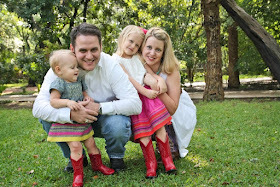 We went yesterday to have Taylor's one year old and our family pictures done by Lisa Woods. She's given us a sneak peek on her blog and I can already tell that I'm going to have trouble picking my favorites. The rain held off just long enough for us to enjoy all the flowers in Mayfield Park and for Lisa to get some great shots. While you are at Lisa's blog, you should see all the other great pictures that she's taken. I found Lisa after seeing all the great photos she's taken of Adelaide. Thanks for the inspiration Annalee! Taylor can be such a goofball already. She was being really silly after lunch the other day and I grabbed the camera. This is also a great shot of her toothy grin. I just loved Kelly's post about things to give praise for and thought I would do one too. I find myself very blessed on a daily basis. I don't know Kelly personally, but started following her blog when her daughter Harper was born. Now I just love seeing all the cute outfits she has for Harper and can't wait to try her next recipe. I figured if she can cook with a 2 month old then a I surely should be able to with an 11 month old. PRAISE: That I am blessed to have this ball of sunshine in my life and the ability to stay home with her. Taylor has learned to stick her tongue out and it just makes me laugh. PRAISE: That today is my Mom's birthday! HAPPY BIRTHDAY MOMMAS! I have the best Mom and look forward to our daily phone call. Plus I'm really looking forward to our trip to New York next year to celebrate our big 60/30 birthdays. PRAISE: The weather has been gorgeous this week and I've been able to do some outdoor activities with Taylor. We had snack time outside yesterday and basked in the sun. PRAISE: For the random US Weekly magazines that started showing up in the mail. PRAISE: I've gave up potatoes for Lent and even though it's hard, I enjoy the reminder that what Jesus did for us was much harder. I also enjoy how much more involved in the church Chris and I have become in the past year. PRAISE: We are blessed with the best friends and family. PRAISE: Chris is such a great husband and very involved Dad in Taylor's life. I love watching her face light up when he comes home and watching his face light up when he sees her. PRAISE: All the things that I love: Unsweet Tea w/lime from Sonic, sunroofs, a clean house, fresh strawberries, reruns of Gilmore Girls on ABC Family, the DVR so that I can catch up on my shows after Taylor goes to bed, stamping, scrapbooking, my digital camera that helps me capture all the little daily moments with Taylor, facebook, blogging, Google Reader to help me keep up with blog I follow, listening to Chris give Taylor a bath, and when Chris picks up dinner on the way home. I found a Little Lambert Leprechaun today and thought you might enjoy seeing her too! 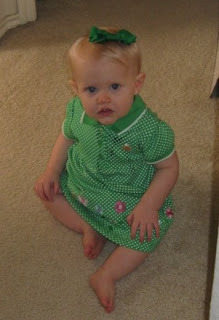 Taylor's Nana got her this green dress so that she wouldn't get pinched. This time last year I was humongous and nesting like a crazy person. My spring break was spent washing Taylor’s clothes and putting the final touches on her room. I was also getting pretty good at the Nintendo DS since the writer’s strike had put a kibosh on spring television programming. 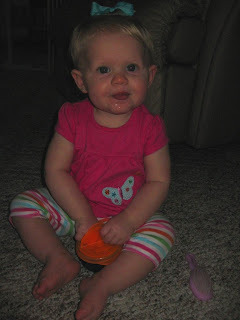 Now I am preparing for Taylor’s first birthday and watching our baby girl take small steps towards being a toddler. Taylor loves to eat and will eat almost anything you give her. (plus the raisinets that she wasn’t supposed to) She is also pretty ‘verbal’ in letting us know when she wants more or wants what we have by grunting. I am working on sign language and words, but we are still learning. We are also working on eating out of a bowl and we tried a spoon, but that was more of a toy than anything. Taylor’s favorite game right now is peek-a-boo and can turn even a newspaper into a game of peek-a-boo. She has learned how to open cabinet drawers and doors. She loves to go through my make-up drawer and throw everything on the floor. Taylor also loves to destroy my Tupperware cabinet on a daily basis. Taylor is learning to share. She will go to put the toy or snack in your hand and then take it away very quickly. It’s pretty funny when she does this. The girlyness is starting to show up more and more. Taylor loves to play with her brush or try to brush her hair while I am. She will even brush my hair for me. (It’s really sweet!) She will also bring me her bow if it falls out so that I can put it back in again. Chris was playing music for Taylor the other day and figured out that she likes to sing to Poker Face by Lady Gaga. She oooo’s along with the song. This month she’s really started to figure out how to push the buttons on her toys to get them to work or play music. This month’s photo session started out really good and then Taylor figured out there was more to do than just sit in the chair or try to climb down like she normally does. I completely forgot to have Taylor pull a name yesterday, so we did it today. I shouldn't be amazed anymore when drawing a name out of a bowl turned into a game for Taylor. She had so much fun taking all the names out and putting them back in. We repeated this many times and it's funny that she continuously grabbed the same name first. And in case you can't read it, it's Heather! Marie will be looking cute in green bows soon! I have to tell you that this was fun and I might have to do another contest again soon. If you didn't win, you can get creative too and enjoy all the free instructions for making hair bows at Girly Things. She has a great website on how to make MANY different kinds of bows and even pictures to follow. It's the best site I've found. Now go get some ribbon and go crazy! I'm sure by now you know of our little girls curiosity. I have amazed myself with how fast I can open the fridge or freezer door, grab what I need, and close it before Taylor get get in there. I wasn't quick enough this time and she decided to do some 'shopping'. She's only pulled a few items out, but after looking at this picture I realize that I need to do a MAJOR fridge cleanout before she does it for me. Guess I'll have to put the bon-bons down and get to work! So what do you get when you combine ribbon, a hot glue gun, and a crafty momma? You get a bunch of new bows to match Taylor's spring outfits! Sorry this week's picture is coming to you so late, but I caught the cutest shot of Taylor today. We've had contractors at our house lately working on the deck and Taylor loves looking out the window and watch them. They even wave back at her from time to time. Notice that she is tall enough to look at the window but still finds a need to stand on her tippy toes to see better! She is a funny little girl but I think she's still mad about me taking away her chocolate. So I thought I would be posting cute pictures from today since we went to the Children's Museum this morning, but instead I get to post from our afternoon adventure. I really don't blame Taylor for being mad. I would be mad too if someone took chocolate away from me too! Guess she didn't get the memo that she can't eat chocolate for a couple more months. I opened the nightstand drawer to get a Kleenex and she quickly found a box of Raisinets. Sneaky little girl had some in her mouth before I could get to her and then proceeded to put the other handful in her mouth as soon as I retrieved the mouthful she had. It's really hard not to laugh when she looks so cute happy as could be with a mouthful of chocolate. I was able to grab the camera and snap a few shots of our chocolate girl.